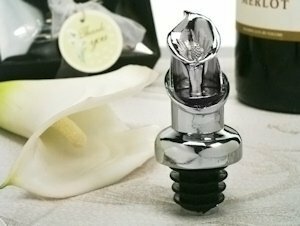 Our elegant combination wine pourer/bottle stoppers are sure to impress! Each solid chrome metal wine pourer is adorned with a charming Calla Lily design stopper. This useful favor will bring back fond memories of your special event with each use. They come ready to give in a delightful black velvet lined gift box and finished with an organza ribbon and a Calla Lily theme thank you tag. Measures 3.5" tall.